Judging a man by his bench press is the worst cliché in fitness—and it’s not going away. No matter how many creative, new, and so-called “functional” exercises come out, nothing seems to supplant the bench as the lift guys want to be the best at. In six weeks, we can help you hit higher benchmarks (forgive the pun) and put up more weight than you’ve ever been able to before, so that the next time someone asks you how much you bench, you won’t have to lie—unless to spare their feelings. For most guys, the bench press stalls somewhere between 225 and 315 pounds—two or three plates on each side of the bar. Doing the typical pyramid sets of 12, 10, 8, and 6 reps, as many do, isn’t going to unstick it. You need to practice lifting heavy for one rep only—this is how you prepare your body for the stress of a max lift. And while your goal may be to just get your bench press going again, our program works the whole body. The more muscle you work, the bigger you’ll get overall; and a bigger, stronger body—from head to toe—will lead to a more beastly bench press. Complete Day I and II on back-to-back days, rest a day, then do III and IV in the same fashion. Exercises marked “A” and “B” are supersets: Complete one set for A, then immediately do a set for B before resting. See the table below for instructions on how to progress your bench press each week depending on your goal—225 pounds or 315 pounds. If your max lies somewhere in between, below, or beyond these numbers, follow the table but use approximate percentages of your goal max to guide you. For the sets of 1, start at around 90% of the max you want to hit and gradually increase it by 1–3% weekly in accordance with the table. For the back-off sets of 5, 4, and 3 reps, start with 80% of your goal max and progress it similarly. You’ll have to estimate the best loads based on how you’re feeling, but try to follow the model here as closely as you can. Steve Pulcinella is a former professional strongman and the owner of Iron Sport Gym in Glenolden, PA. Note: “5×1,” for example, means 5 sets of 1 rep. Perform all the sets of single reps and then do the back-off sets of 3–5 reps. All weights are in pounds. Rest as needed after each set. your knees outward as you straighten them. Increase the weight after each set. in line with your feet. Remove the safety, then lower the weight toward your chest until they’re bent 90 degrees. Press back up. Set up as you did to squat. Brace your abs and pull your hips back as far as you can. Bending your knees only slightly, lower your torso as far as possible without losing the arch in your lower back. Squeeze your glutes and push your hips forward to return to the start position. Hold a barbell with a shoulder-width grip. Pull your hips back as far as you can, allowing your knees to bend as needed while you lower the bar along your shins until you feel a stretch in your hamstrings. Keep your lower back arched throughout. Attach a band to an overhead object and grasp an end in each hand behind your neck. Facing the other way, crunch your torso toward your hips. See the description in “The Perfect Bench Press” on page 3. Grasp the bar with an overhand grip at shoulder width and let it hang in front of your thighs. Bend at the hips and lower your torso until it’s almost parallel with the floor. Squeeze your shoulder blades together and pull the bar to your belly. Set a barbell in a power rack at about hip height. Lie underneath it and grasp it with your hands about shoulder-width apart. Hang from the bar so your legs and torso form a straight line. Pull yourself up until your back is fully contracted. Hang from a pullup bar with your hands outside shoulder width and your palms facing forward. Squeeze your shoulder blades together and pull your- self up until your chin is over the bar. Hold the bar with your hands shoulder-width apart and your arms at your sides. Curl the bar without allowing your elbows to drift forward. Grasp the bar with hands shoulder-width apart and raise your elbows until your upper arms are parallel with the floor. Take the bar out of the rack and let it rest on your fingertips—as long as your elbows stay up, you’ll be able to balance the bar. Step back and set your feet at shoulder width with your toes turned out slightly. Squat as low as you can without losing the arch in your lower back. When you get to the bottom of the movement, press up from your heels to the start position. Stand with your feet about hip-width apart. Push your hips back and bend your knees to reach down and grasp the bar so your hands are just outside your knees. Keeping your lower back in its natural arch, drive your heels into the floor and pull the bar up along your shins until you’re standing straight with your hips fully extended and the bar out in front of your thighs. Increase the weight each set. Hold the bar with hands shoulder-width apart, resting against the top of your thighs. Shrug your shoulders as high as you can. Lock your legs into a back-extension bench and allow your torso to bend forward so that your hips are bent almost 90 degrees, but don’t lose the arch in your lower back. Squeeze your glutes and extend your hips so that your body forms a straight line. See the description in Day I.
Grasp the bar just outside shoulder width. Take the bar off the rack and hold it at shoulder level with your forearms perpendicular to the floor. Squeeze the bar and brace your abs. Press the bar overhead, pushing your head forward and shrugging your traps as the bar passes your face. Set an adjustable bench to a steep incline and sit on it so your back is supported. Hold a dumbbell in each hand at shoulder level and brace your abs. Press the weights straight overhead. Hold the bar with hands slightly farther outside shoulder width than for the overhead press. Squeeze your shoulder blades together and pull the bar to chest height. Your elbows should be bent 90 degrees in the top position and your upper arms should be horizontal. Hold a dumbbell in each hand at your sides. Raise your arms 90 degrees until they’re parallel with the floor. Suspend yourself over parallel bars and lower your body until your upper arms are parallel with the floor. Attach a straight bar to the top pulley of a cable station and grasp it with your hands shoulder-width apart. 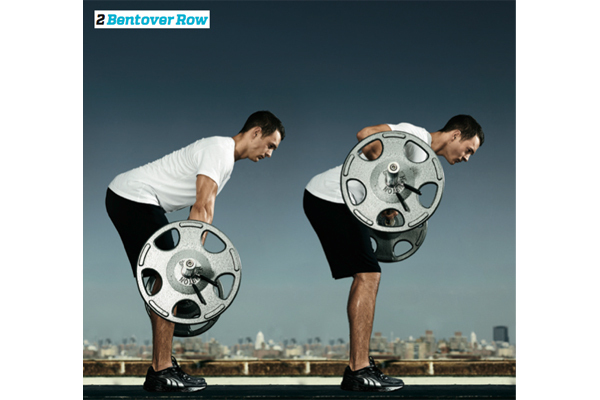 Keep your elbows at your sides and extend them, pushing the bar downward.